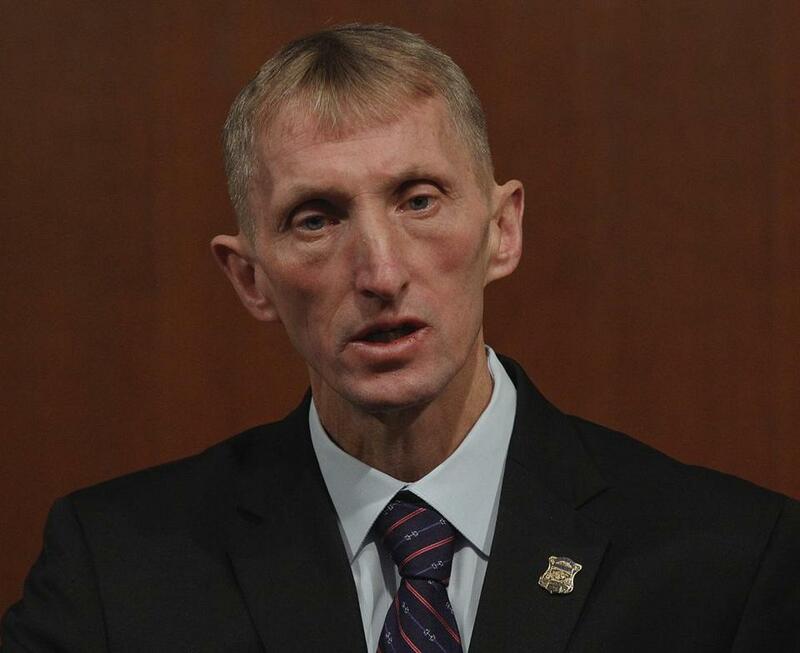 “I cannot fathom losing a child to gun violence, and going on,” said Boston Police Commissioner William B. Evans. Boston Police Commissioner William B. Evans joined President Obama in Fairfax, Va., on Thursday night for a town meeting on gun violence, days after the president announced a set of initiatives to fight the scourge of mass shootings in the country. Evans told the Globe before the event, which CNN broadcast from George Mason University, that he was attending to continue Boston’s push to cut the flow of illegal guns into the city. “I think we all share a bond in the fact that the less guns we have out there in circulation, it’s a safer and better society that we are in,’’ Evans said. During the town hall, the president discussed a number of actions that his administration is rolling out in an effort to keep guns from criminals and the mentally ill.
Evans said earlier Thursday that Mayor Martin J. Walsh’s administration is trying novel strategies to combat gun violence in Boston, including sending letters to licensed gun owners, reminding them of their responsibility to safeguard their weapons. The gun control laws in Massachusetts are among the strictest in the nation, which Evans said helped to significantly reduce the number of homicides last year. Evans also applauded Obama for the executive orders that he issued this week designed to control the sale of guns. While discussing his plans at the White House, Obama had tears in his eyes as he recalled the victims of the 2012 Newtown, Conn., mass shooting. In addition, Evans voiced support for the administration’s effort to allow law enforcement to review a person’s mental health history as part of the background check before that person can buy a gun, something authorities have not been allowed to do. “These issues are really important to keeping our cities safe,’’ Evans said. Before traveling to Fairfax, Evans testified on Beacon Hill in support of proposals to make replica handguns look less authentic. The Walsh administration recently won City Council approval to allow police to seize replica handguns. Evans said before he testified that requiring an orange stripe on replicas is helpful, but may not be the ultimate answer because officers have found replicas where orange plastic was colored black. He expanded on those comments during his testimony before the Joint Committee on Public Safety and Homeland Security. “We come upon too many incidents too many times where people have these type of guns, and fortunately my officers have used a tremendous amount of restraint and not used deadly force when it was clearly within their right,” Evans told lawmakers. During 2015, Evans said, his officers seized 174 replica handguns and seized nearly the same number, 179, one year earlier. Material from the State House News Service was used in this report. John R. Ellement can be reached at ellement@globe.com. Follow him on Twitter @jrebosglobe. Travis Andersen can be reached attravis.andersen@globe.com. Follow him on Twitter @TAGlobe.